The first free release 13.0 is more or less the same as the current commercial release 12.3 in regard to functionality with all the licensing removed and (hopefully) all references to ModelMaker Tools BV changed to new targets. Alas, the Delphi 5 and 6 versions didn’t make it into this transition, as they would have required too much special treatment. The current release thus supports Delphi 7, Delphi 2007 – 2010, Delphi XE – XE8, Delphi 10 Seattle, Delphi 10.1 Berlin and Delphi 10.2 Tokyo. This is sitting on my desktop for quite a while waiting that I find the time to write this blog post. So now be it. DprojNormalizer as well as DprojSplitter are one-purpose plugins. If they are installed, they do their jobs. No switches, no settings inside the IDE, although DprojSplitter respects an optional configuration file. Both plugins can be installed side by side without one interfering with the other. Although this lean approach has some advantages, it also has some drawbacks: a good portion of the code is similar and the IDE events handled are almost the same. But the most prominent issue I have with these one-purpose plugins is: I am running out of proper icons. 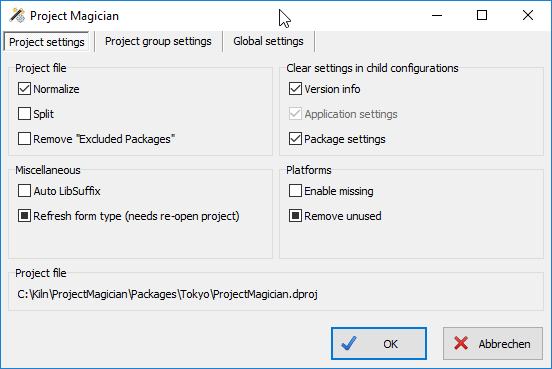 This was the birth of Project Magician which combines the features of DprojNormalizer and DprojSplitter adding some new features that roughly fall into the same area. In contrast to both other plugins Project Magician now has settings inside the IDE. Have a look at the settings form for the Project Magician project itself. The settings are grouped in four different areas. Project file settings contains the Normalize and Split entries, which resemble the already know behavior of DprojNormalizer and DprojSplitter. The third option in this group allows to remove the Excluded Packages entries from the project file. Usually this entry is unnecessary and depends on the local installation often causing trouble on commits. It will be re-created automatically with default settings when a project is opened. Clear Settings in Child Configurations probably needs some words of explanation. Sometimes the inheritance of project settings as implemented in the IDE is not wanted and leads to a lot of work or unexpected results. For instance, having different version info values for each build configuration is rarely required. Changes made to one configuration are not visible in others. In addition inheritance doesn’t work well with these either. Changes in the base configuration have no effect if values in depending configurations exist. That said, the Version info option clears all settings made in child configurations and only keeps the settings in the base configuration. In case of a pure Windows project this actually is the base configuration, while for mixed OS projects each platforms base configuration serves as a basis. Note that the Module attributes are excluded from the clearing so that each build configuration can have its own attributes. Application Settings are always platform specific and thus the settings in the platform base configuration are the ones kept. The settings targeted here are Icons, Manifest File, Output Settings and Appearance. Package Settings affect Prefix, Suffix and Version as well as the Description and the Never Build option. Needless to say that Package Settings are only enabled for packages while Application Settings have only a meaning for applications. When upgrading a project from a previous Delphi version it sometimes happens that you cannot add platforms even if they are available in the IDE. This is where Enable Missing Platforms steps in, enabling all platforms known to the current Delphi version, even if they are currently not available for your SKU. Although you still can only add those platforms provided by your IDE, the other platforms can later be enabled on systems that include them. Projects that are only useful for some platform and will never be used on others (like f.i. design time packages) are nevertheless cluttered with platform specific entries for these never be used platforms. When the Remove Unused Platforms option is set Project Magician will remove those entries resulting in a much cleaner project file. This doesn’t remove the ability to add those platforms to the project later. Maintaining packages for different Delphi versions requires to use a decent LIBSUFFIX to distinguish the bpl-files for each version (see Delphi Library Guidelines). Creating the project files for a new Delphi version usually involves copying those from the previous version to a new folder and adjusting the LIBSUFFIX entries. The Auto LibSuffix option eliminates the last step. Sometimes the FormType entries in the project file are missing. This leads to the fact that during design time one cannot instantiate frames affected by this. The Refresh Form Type functionality restores the missing entries when opening a project. As you may notice there are settings for different scopes: global, project group and project. Settings are inherited from the next higher scope and can only be activated in a lower scope, but not deactivated. Take care when activating settings on global level! In the example above Refresh Form Type and Remove Unused Platforms are set on project group level. The global settings can alternatively set from the Tools – Options dialog. The Project Manager options can be found in the Third Party branch. Only as part of the global options you have access to the Clean Line Feeds feature. When opening dpr, dpk, pas or inc files any invalid line feed sequence (like single <CR> or <LF> alone) will be converted to a proper <CR><LF> sequence. Project Magician comes with a command line application that allows to execute most of the tasks done by the plugin from the command line. It is named ProjectMagicianCmd.exe and resides in the installation folder (default: %ProgramFiles(x86)%\ProjectMagician). -v = Sets VersionInfo in dproj files to a given value. Clears all version info entries in child build configurations. Currently Delphi XE3 to 10.2 Tokyo are supported. There are weeks when bug findings are just going to agglomerate. Fixing them as soon as possible then leads to multiple releases in a short time frame. Sorry about that (well, not really), but nothing comes without a price to pay. Another small update for DprojNormalizer is available. This one is only relevant when you have quite a number ( > 10 ) of build configurations in your project, where the hierarchy sometimes gets broken after normalizing. Thanks to Tobias Reißenweber for bringing that to my attention. Update: This turned out to be way more complex as expected! V2.2.3 should be the version to go. The good news is, that I learned a lot about the internal assumptions made by the IDE developers.